Inca Dove. This bird species’ coos (and dozens more) have been converted into musical notation. When Nat Wheelwright listens to birdsong, he hears information—what a bird is communicating to a potential mate, rival, or eavesdropper. Robby Greenlee hears colors, rhythms, and melodies. They may not be birds of a feather, but the two Bowdoin College professors—one an ornithologist and the other a composer and music theorist—are teaming up to transcribe and analyze a variety of birdsongs. In the process they hope to uncover new evolutionary and musical insights. To launch their project this past summer, they enlisted John Butterworth, a Bowdoin student and jazz saxophonist, to transcribe into musical notations more than 50 dove and pigeon coos from recordings contained in the vast digital collection of the Cornell University Lab of Ornithology. They eventually hope to move on to other bird species, such as Baltimore orioles and brown creepers, but they wanted to start with relatively simple vocalizations. “It’s extremely difficult to transcribe, because birds do such complex things,” Greenlee says. Click here for a link to a recording of an Emerald Dove (Chalocophaps indica) from the Macaulay Library at the Cornell Lab of Ornithology. The top figure is an oscillogram and shows amplitude (loudness) of different notes. The one below, aligned in time, is a sound spectrogram or sonogram, showing frequency (pitch), including harmonics and other overtones (which give a sound its distinctive timbre). Their initial work on dove vocalizations shows that birds within the same evolutionary branch, or clade, seem to share musical characteristics. For example, says Wheelwright, “the mourning dove [found in the United States] seems to sing in simple time, where the beat is divided into a multiple of two, whereas some of the Old World doves [which belong to a different clade] sing more in compound time, where the beat is divided into three. “Birds that are closely related tend to sing the same way, which is different from other characteristics like color, which tends to be something very much related to your environment,” Wheelwright says. Working with Wheelwright has challenged Greenlee to scientifically quantify the musical patterns he hears in bird music. “I realized there is so much I have to take into account when figuring out how long each of these pulses should be, figuring out which was strong and which was weak, and how a pattern occurs [so that] this is something that somebody else could replicate and get the same results.” That close attention to detail, for example, helped Greenlee to see that the Mourning Collared Dove is more precise in creating meter (only 2/100 of a second off) than humans are. That sense of discovery is mutual. “I had to smile at the syncopation” of some doves, Wheelwright says. “It just sounds like rock music. They create an expectation of a beat and leave you hanging … or they accelerate it. My intuition tells me the reason they do it is precisely the same as in human music,” he says. “It’s the little surprise it carries to the intended audience.” For birds, it might be just the right technique to catch a mate’s attention. 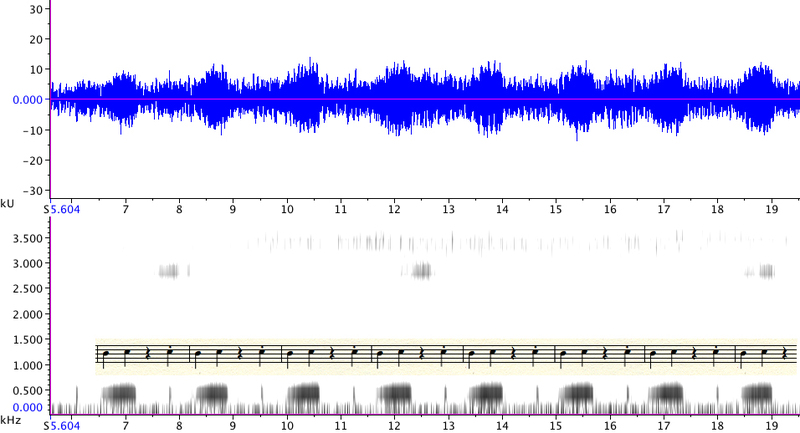 This entry was posted in Uncategorized and tagged biology, birds, birdsong, Cornell Lab of Ornithology, doves, evolution, Inca Dove, music, musical notation, ornithology, research by Susan Frith. Bookmark the permalink.